and you will have left. We have three more meetings to go. The egg box is empty. There will still be eggs. what do want me to do? the harder it’s going to get. situation, 10 years from now? Going down with breaks pulled hard. the cloth of gold skirt. a sharp bowl of new tin. strung like a Cocteau assemblage. They will be there forever. Ref: Walker Evans. 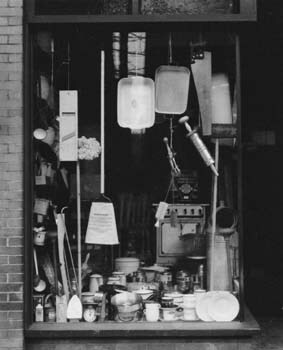 Window Display. Bethlehem, Pennsylvania. shadow for eyes; staring at me. sidled over to the chairs far side. shining off the mirror near to him. ballet dancer. Son of a miner. 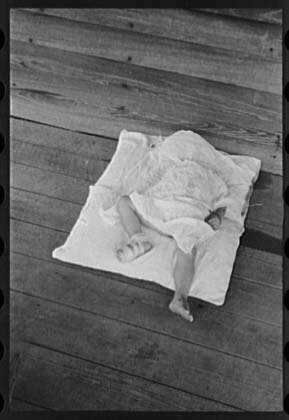 Portrait of a Baby by Walker Evans, 1936.
completely covering its head and face. decorated with a bandage. It is a hot day. I’m not one those English people pretending to be Welsh. stagger me with their violence. My mother is Welsh. rising up in cast off clouds and settling silent as soft shoes. from her lips and slipped into my skin like a cold and sunny day. hard wired amongst my TV jingles and night time prayers. we never got around to it. in my throat. It tastes like metal.